Hurricane Beatriz has weakened to a tropical storm as it moves away from the Pacific coast of Mexico. Beatriz had been threatening some of Mexico's most popular resorts and left tourists sheltering in hotels, but all warnings have now been cancelled. Pacific ports which were closed along the coast are gradually being reopened. The US National Hurricane Center said winds had fallen to 110km/h (70mph) and were expected to continue weakening over the next two days. The first Pacific hurricane - Adrian - formed earlier this month, causing no damage, but forecasters predict a busier hurricane season over the Atlantic. Casualties have been light. One tourist is reported to have been injured by a falling tree in Acapulco. The Mexican government issued a red alert for areas around the resort city of Manzanillo. And hurricane warnings were issued along coast from Lazaro Cardenas north to Cabo Corrientes. Early on Tuesday, Beatriz had reached winds of up to 150km/h (90mph), and was moving over the coast. 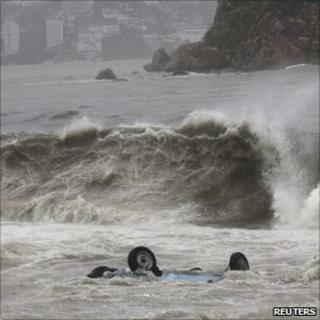 The storm was expected to drop 15-30cm (6-12in) of rain along the coast, with a risk of flash floods and mudslides. The US state department issued a message urging American citizens to find shelter, monitor news reports and follow official instructions. Mexico has no major oil installations in the Pacific, but its coastal resorts are popular with American tourists.